Once a month over on The Ink Nest blog, I contribute a post about trends. When Sabina asked if I would be interested, I have to tell you - I never paid attention to trends. After spending many hours researching 2014 trends and sourcing for images, I feel like I'm slowly becoming quite the expert. I think it's important as an illustrator to be aware of what is trending now and what is going to be trending in the future, but it is equally as important to follow what interests you. Myself, I believe elephants and the color turquoise will always be one of my favorites! Anyways, stop over and see my post this month on the "folk" trend. I'm very proud of it and a bunch of us Ink Nest artists created some new sets for the shop. 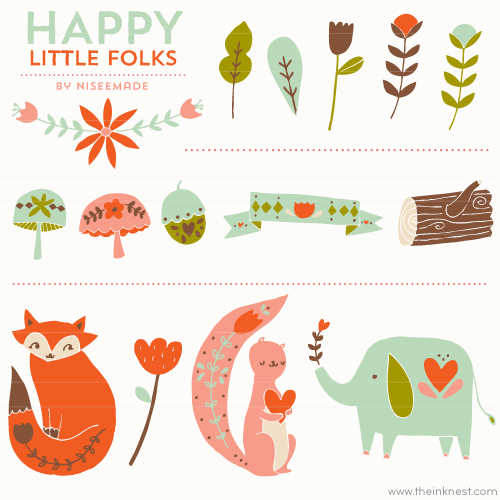 My new set is available in my etsy shop Little Happy Drawings and over on The Ink Nest.